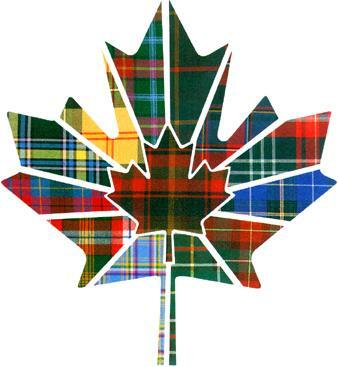 The regional tartans of Canada, with the national maple leaf tartan in the centre. Clockwise from bottom left (light blue and pink) are the tartans of Yukon, Northwest Territories, British Columbia, Alberta, Saskatchewan, Manitoba, Ontario, Quebec, New Brunswick, Nova Scotia, Prince Edward Island, and Newfoundland and Labrador. 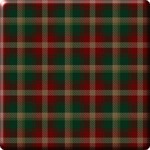 The idea for Alberta's official tartan began in 1961 at the Edmonton Rehabilitation Society, a charitable organization that taught handicapped students how to operate handlooms. 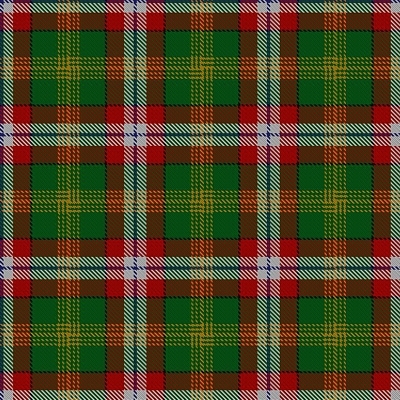 The tartan was designed by Alison Lamb, the Society's executive director, and Ellen Neilsen, the weaving instructor, and was officially adopted by the province in an act of legislature in March 1961. Green represents the province's forests, gold is for its wheat and sunshine, blue is for the lakes and skies, black is for the oil and coal, and pink is for the provincial emblem, the wild rose. Its International Tartan Index number is 2055. BC's official tartan was designed by Earl K. Ward in 1966 to celebrate the 100th anniversary of the 1866 union of Vancouver Island and British Columbia. Entered in the Lyon Court Book No. 18 in January 1969, the tartan was officially adopted in 1974 through the BC Tartan Act. 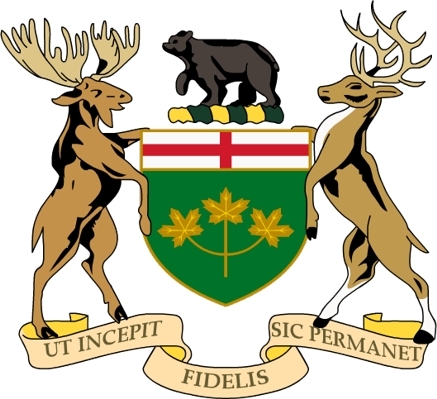 The white accents represent the province's official flower, the Pacific Dogwood, while gold is for the sun and the crown in the provincial flag. Blue is for the Pacific Ocean, red is for the maple lead, and green is for the province's forests, which cover an area twice as large as New York and New England combined. Its International Tartan Index number is 808. Manitoba's official tartan was designed in 1962 by Hugh Kirkwood Rankine, who was born in Winnipeg to Scottish immigrant parents. Rankine became interested in tartan during a leave in Scotland during the Second World War. He learned how to weave when he returned home, and eventually produced what he called a "history in cloth." This tartan was officially adopted by the province in "The Coat of Arms, Emblems and the Manitoba Tartan Act" on May 1 of that year. The act also declared April 6 as Manitoba Tartan Day, in recognition of "the role that Scottish Manitobans have played and continue to play in Manitoba's cultural heritage." 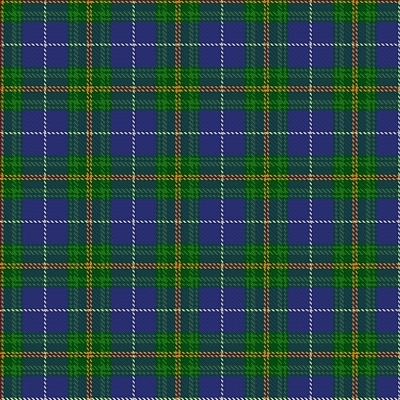 The red in the design originates from the Earl of Selkirk's Red River Settlement, while the blue was adopted from the Clan Douglas tartan. The green accents represent the ethnic mosaic that makes up Manitoban society while the gold pays homage to the province's agricultural history. Its International Tartan Index number is 144. 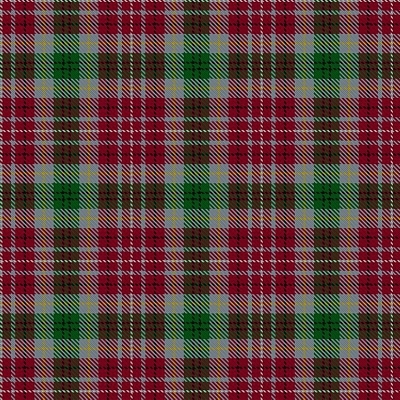 The official tartan of New Brunswick was commissioned by William Aitken, Lord Beaverbrook, in 1959 and designed by the Loomcrofters company in Gagetown, a "pretty village on the Saint John River." 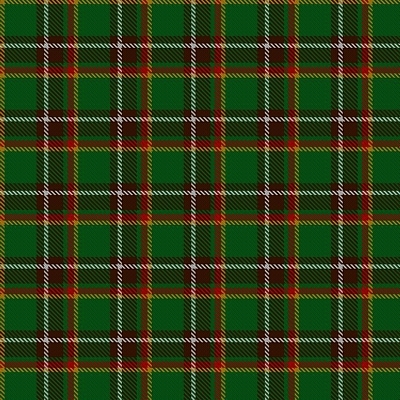 It was officially adopted as the provincial tartan by an Order in Council in the same year. The "beaver brown" colour was included to honour Lord Beaverbrook, a press baron who immigrated to the province with his parents from Scotland at the age of thirteen. The colour red was chosen to signify the courage and loyalty of the New Brunswick Regiment and the early Loyalist settlers. Forest green pays homage to lumbering while meadow green represents agriculture. Blue symbolizes the coastal and inland waters, and the gold accent symbolizes the province's potential wealth. Its International Tartan Index number is 1880. 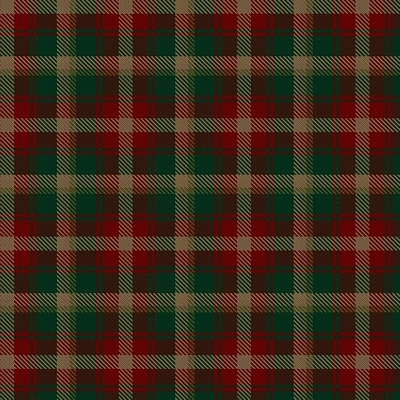 The official tartan of Newfoundland and Labrador was designed in 1955 by Louis Anderson, who turned its production over to Sam Wilansky, a clothing store owner in St. John's. The Minute of Provincial Affairs petitioned the Lord Lyon to record the tartan in 1972, and it was entered in the Lyon Court Books the following year. Its colours are green for the pine forests, white for the snow, gold for the sun, brown for the minerals of the Iron Isle, and red to commemorate the Royal Standard of the province's British origins. Its International Tartan Index number is 1543. Janet Anderson-Thomson decided that the North West Territories needed an official tartan after she attended an RCMP ball in 1966 and noticed that the piper was "terribly drab". She suggested the idea to Stuart Hodgson, Commissioner of North West Territories, who gave her the go-ahead. Anderson-Thomson then enlisted the help of Hugh MacPherson of Edinburgh, who produced three draft designs for an official committee to choose from. MacPherson wove each draft with colours suggested by Anderson-Thomson: green for the forests, white for the frozen Arctic Ocean, blue for the Northwest Passage, gold for mineral wealth, and red-orange for the Arctic prairies with a thin black accent symbolizing the tree line. The tartan was registered at the Court of the Lord Lyon in 1972, and officially adopted by the 48th Session of the Territorial Council in January 1973. Its International Tartan Index number is 662. Nova Scotia's tartan is the oldest official provincial tartan in Canada, designed in 1953 - almost by accident! Mrs. Bessie Murray, the President of the Halifax Weavers' Guild, designed a trade display on sheep rearing for a breeders' convention in Truro. In the display, a shepherd wore a completely new tartan that Mrs. Murray had designed to avoid any potential show of favouritism. 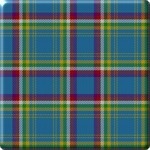 Her new tartan earned so much admiration and popularity that it was adopted as the official provincial tartan in 1963. The colours represent the blue of the sea and the sky, the dark and light green of the evergreens and decidious trees, the white of the granite rocks and coastal surf, the gold of Nova Scotia's Royal Charter, and the red of the lion rampant on the provincial crest. Its International Tartan Index number is 1713. Up until 2000, the accepted, but unofficial, provincial tartan was a fairly simple sett designed in 1965 by Rotex Ltd. The Ontario tartan then found a champion in Bruce-Grey-Owen Sound MPP Bill Murdoch, who introduced the Tartan Act in 2000. 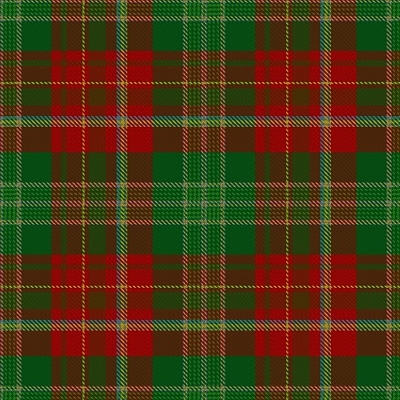 He commissioned Jim MacNeil, Chair of Scottish Studies at the University of Guelph, to design a new tartan that would appropriately represent Ontario. 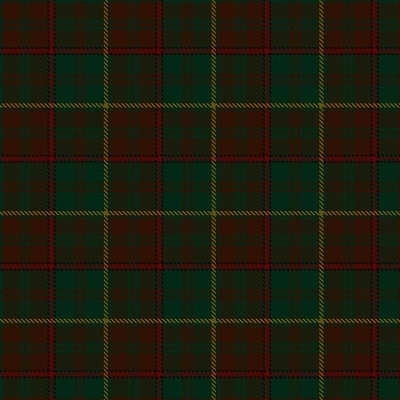 Although parliamentary inaccuracies delayed the official adoption of MacNeil's complicated sett by six years, the province was finally awarded with a tartan that reflected its rich landscape and heritage. 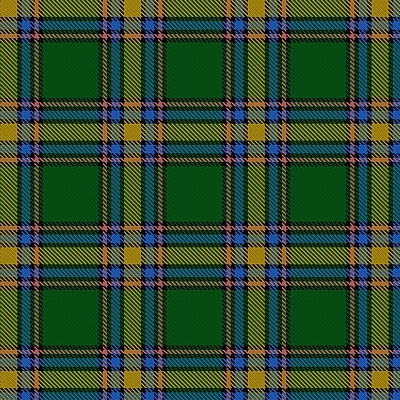 Based loosely on the tartan of Sir John Sanfield MacDonald, Ontario's first premier, the three shades of green represent Ontario's forests and fields, the two blues represent its huge expanses of water, white represents the sky, and red represents the First Nations people. Its International Tartan Index number is 6627. 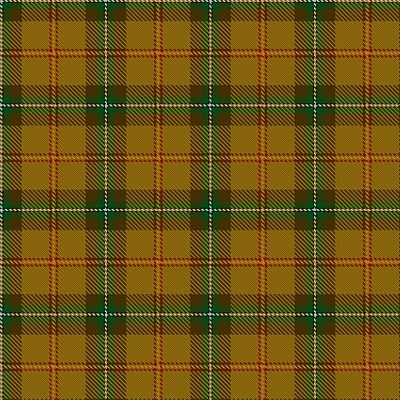 The unofficial tartan used between 1965 and 2000 was known as the Ensign of Ontario, and was inspired by the Provincial Coat of Arms: yellow is for the three maple leaves that appear on the green shield; red is for St. George's Cross; black is for the bear sitting atop the shield; and brown is for the moose and the deer. Designed by Jean Reed of Covehead, York, the official tartan of Prince Edward Island was selected through a government-sponsored contest, and was officially adopted on June 16, 1960. Mrs. Reed explained that she used the colours "red for the warmth and glow of the fertile soil, green for the gield and tree, yellow and brown for Autumn and white for the surf or a summer snow." 1 Its International Tartan Index number is 918. Quebec is the only province whose tartan has not been officially adopted or registered with the Lord Lyon. Known as the Plaid du Québec, it was designed in 1965 by the clothing manufacturer Rotex Ltd, the same company that designed the Ensign of Ontario. 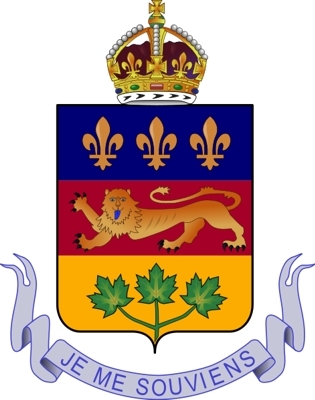 Its colours are derived from the province's coat of arms: the blue is taken from the background in the upper division of the shield, red is from the background of the centre division, green is for the three maple leaves of the lower division, gold is for the crown and lion passant, and white is for the scroll containing the province's motto, Je me souviens. Its International Tartan Index number is 1949. 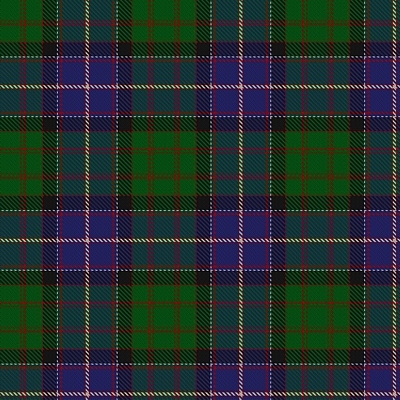 Saskatchewan's tartan was created in 1961 by Mrs. Frank Bastedo, wife of Frank Lindsay Bastedo, former Lieutenant Governor of Saskatchewan. The colour palette represents Saskatchewan's identity as the "breadbasket" of Canada: the predominant gold represents prairie wheat, brown represents summerfallow (a century-old farming practice used to conserve soil moisture), yellow is for rapeseed flower and sun flower, green is for the forests, red is for the provincial flower, the Western prairie lily, white is for snow, and black is for oil and coal. Its International Tartan Index number is 1817. 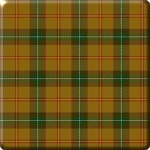 The official tartan of Yukon was designed by Janet Couture of Faro in 1965. 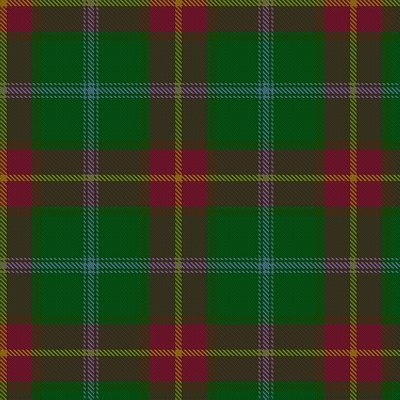 It was first proposed during the Canadian Centennial as the territorial tartan in 1967, but both the Territorial Council and the Scottish Tartan Registry rejected it. 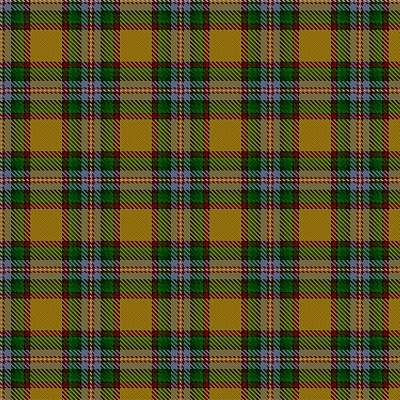 The government rejected it due to concerns about the legal implications of a private individual holding the design's copyright, while the tartan registry rejected it on the grounds that it was simply a plaid rather than a true tartan. 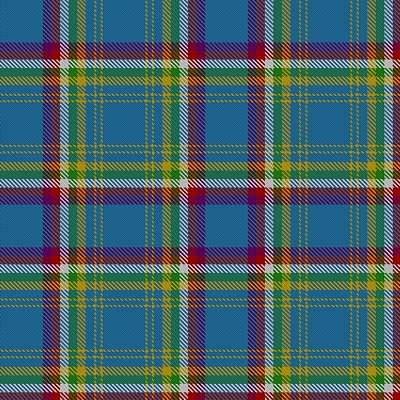 The design was resubmitted to the Lord Lyon for approval with minor changes in 1984; later that year it was officially adopted as the territorial tartan. Its unique colour palette represents the poetic beauty of the Yukon landscape, and carries a lyrical description: "The crystalline blue background represents Yukon's sparkling, glacier-fed waters and its clear mountain skies. Magenta reflects the colours of the Yukon's floral emblem, the firewood of late summer. Green is symbolic of Yukon's great expanses of wilderness forest and purple symbolises the majestic thrust of mountains into the northern sky. White represents the purity of the winter snow that crowns the peaks and blankets the alpine meadows. The yellow represents the long, soft evenings of the midnight sun and the Yukon's famous deposits of gold." 2 Its International Tartan Index number is 2129. Designed in 1964 by David Weiser in anticipation of the centenary of Dominion, the Maple Leaf Tartan is the unofficial tartan of Canada. The Commercial Division of the Office of the High Commissioner for Canada said of the design, "In creating the Maple Leaf Tartan fabric, David Weiser captured the natural phenomena of these leaves turning from summer into autumn. The green is the early colour of the foliage. Gold appears at the turn of autumn. Red shows up at the coming of the first frost. The two tones of brown find their way throughout the leaf creating a prolific profusion of colour." Its International Tartan Index number is 2034. Even Essex County has its own official tartan! 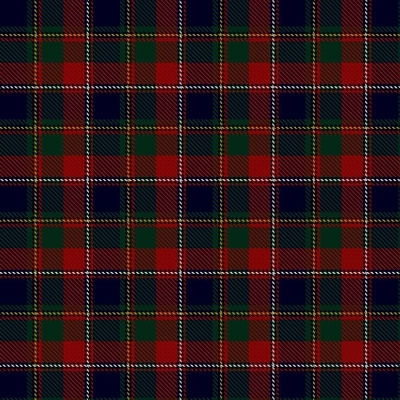 The Essex County tartan was designed in 1983 by Mrs. Edythe Bakes of Leamington, Ontario. Born in 1902, Mrs. Bakes grew up near Orillia, where, as a young woman, she designed and made her own clothing. She moved to Essex County when her husband, Arthur, took a position as Branch Manager at the H. J. Heinz Company. Mrs. Bakes was quite interested in the history of Canadian tartans and decided to design one for the county of her residence. Once she had completed it, she offered it to Essex County Council, which officially registered it with the Canadian government and the Museum of Tartans in Scotland. 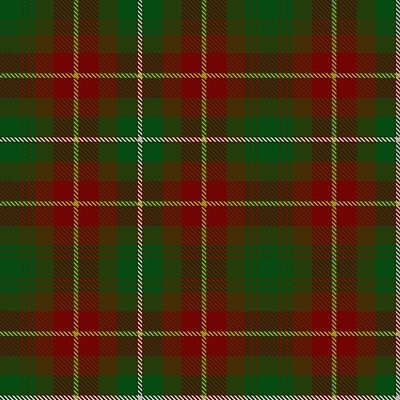 In 1985, the Women's Institute took up the responsibility for marketing the tartan, and, according to Mrs. Bakes' wishes, donated the proceeds from the sale of the tartan to local charities, including the Leamington District Memorial Hospital, the Salvation Army of Leamington and Essex, and the Essex Food Bank. The original tartan cloth is on display at the Essex County Civic Centre, and can be purchased through the County Administration Office. Mrs. Bakes designed the tartan using colours chosen to represent specific aspects of the Essex County. The golden yellow is for Essex's lush harvest - the golden grains, corn, soy, barley, oats, and wheat; green represents its spring fields; blue is for the skies and waters; white represents the fish and salt mines; black showcases its automotive heritage; and the colour red pays homage to Leamington's nickname, the "Tomato Capital of the World." Its International Tartan Index number is 1840.